Professor Parker Pearson continued: “When we stumbled across this extraordinary natural arrangement of the sun’s path being marked in the land, we realized that prehistoric people selected this place to build Stonehenge because of its pre-ordained significance. 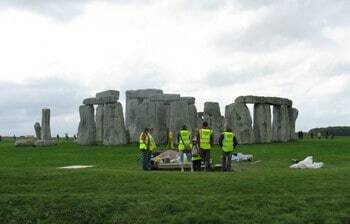 This might explain why there are eight monuments in the Stonehenge area with solstitial alignments, a number unmatched anywhere else. Perhaps they saw this place as the centre of the world”. Previous theories have suggested the great stone circle was used as a prehistoric observatory, a sun temple, a place of healing, and a temple of the ancient druids. The Stonehenge Riverside Project’s researchers have rejected all these possibilities after the largest programme of archaeological research ever mounted on this iconic monument. As well as finding houses and a large village near Stonehenge at Durrington Walls, they have also discovered the site of a former stone circle – Bluestonehenge – and revised the dating of Stonehenge itself. All these discoveries are now presented in Parker Pearson’s new book Stonehenge: exploring the greatest Stone Age mystery published by Simon & Schuster. The research was supported by the Arts and Humanities Research Council, National Geographic and many other funding bodies.